A luxury motor yacht maker plans to create 500 jobs in Dorset with the acquisition of American-owned manufacturing facilities. Sunseeker said it had agreed outline terms, for an undisclosed amount, with US-based Luhrs Marine for its yacht facilities at Osprey Quay, Portland. The company's expansion will create 500 skilled jobs over four years. Production at the 11.5 acre site could start as early as May this year once the deal has been completed. 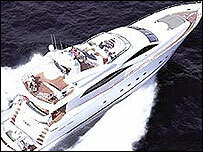 Sunseeker, based in Poole, is the world's largest privately-owned builder of motor yachts employing 1,800 staff. Robert Braithwaite, managing director and founder of Sunseeker International, said: "Osprey Quay is an ideal location for our future expansion plans. "I am sure that by moving a level of production to the Portland location we will be able to build on the company's success while adding to the growth of the local economy and utilising the boatbuilding skills available in the area." Luhrs Marine said it would maintain its European headquarters for sales and customer service in the UK. Stephen Cutsforth, Luhrs' managing director, said: "We are pleased Sunseeker has agreed to take advantage of this excellent site and skilled employee base." Colin Molton, deputy chief executive of the South West Regional Development Agency, which facilitated the deal, added: "We are encouraged to see a global brand such as Sunseeker going from strength to strength and expanding in South West England."